Independence, Nutrition, Knowledge, and Sports (L.I.N.K.S.) program. The program currently has 23 young adults (ages 21 to 45) enrolled and a substantial waiting list. Through educational and fun programs, such as exercise, sports, swimming, nutritional planning and cooking, current events, computer training and community outings, members become more self-aware and self-reliant while developing friendships, and team building and leadership skills. LINKS participant, Aidoo has really progressed since joining the program in 2005. 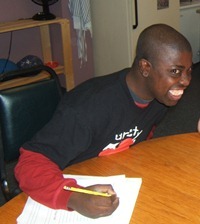 He has made a lot of new friends and he has gained a lot of confidence in himself through learning to read. Aidoo Variety Village Hero April. This entry was posted in Professor Owl's Monthly Newsletter. Bookmark the permalink.